Here are some links to pages about Borromean rings. This is not intended to be a complete list -- people are apparently rather industrious by nature, at least when it comes to Borromean rings, and they seem to have been getting rendered a plenty. This is just a list of the highlights from my browsings for Borromean rings in early 1998, in no particular order. Ned Seeman builds Borromean rings out of DNA in his lab. There is another interesting historical context in which the rings arise. The diagram was found in picture-stones on Gotland, an island in the Baltic sea off the southeast coast of Sweden. These are dated around the ninth century and are thought to tell tales from the Norse myths. To the Norse people of Scandinavia, a drawing of the Borromean rings using triangles is known as "Odin's triangle" or the "Walknot" (or "valknut" -- the knot of the slain). The symbol was also carved on the bedposts used in their burials at sea. There is a rumor that a fellow by the name of George Odom has also made Borromean sculptures, but I couldn't find anything more out about that. 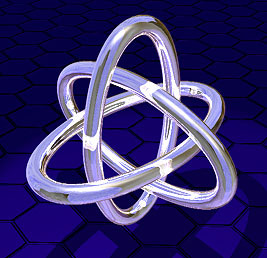 Theorem: Borromean rings cannot be realized in 3-D using circular rings. Suppose you have a link in R3 made of circles such that any two circles have linking number 0. Then the link is trivial. Why? Consider the 4-D unit ball B4. First put R3 stereographically onto the ball's surface S3 (this preserves circles). Each circle now bounds a (flat) 2-disk in B4. When two circles have linking number 0, the corresponding disks do not intersect (Can you picture this well enough to believe this claim? I have trouble visualizing this). Now consider the family of concentric 3-spheres centered at the origin. The intersections of the spheres with the family of disjoint disks gives a homotopy of the link, except that at certain strategic moments, certain of the circles vanish to a point and disappear. Anyway this homotopy shows that the link is the trivial link. Given any arrangement of circles in 3-D, you can steadily shrink the areas of the circles without any of the circles ever touching each other, until each circle is reduced to a point (therefore nothing "went through" it), whereupon you can remove that circle from the others (therefore it wasn't linked to anything in any way). in which we can see that one "end" of any ring can be "shrunk" until it is no longer "swallowed" (eg, the lower end of the C ring), so that the object plainly isn't Borromean. The same argument works if L hits the plane of C in a point outside the disc of C - we just project from this point (which is just the intersection of the planes of all three rings. The only case left is therefore that in which the three discs have a common point. Call it P. The power of the point P (the product of the two distances to a given circle on any line through P and the circle) will always be larger with respect to the swallower than with respect to the swallowee, since P is inside both discs. Chasing this inequality around the three circles gives a contradiction, so it is impossible for three (or more) discs to share a common point if each one swallows the next. So such a case in fact cannot occur, so we are done. I conjecture that the converse is also true: Rings are the only thing you can't make Borromean rings out of. That is, given any three simple unknotted closed curves in 3-D, they can always be arranged in a Borromean arrangement unless they are all circles. See John Robinson's art (above) for more examples of Borromean rings made from different shapes.